" Climb the mountains and get their good tidings. Nature's peace will flow into you as sunshine flows into trees. The winds will blow their own freshness into you, and the storms their energy, while cares will drop away from you like the leaves of Autumn ." Dolomites are one of the most beautiful mountain ranges in Europe. The whole range is in Italy - Italians are lucky people! Dolomites are especially loved by winter sports aficionados - these mountains provide fantastic skiing opportunities and guarantee lots of snow. 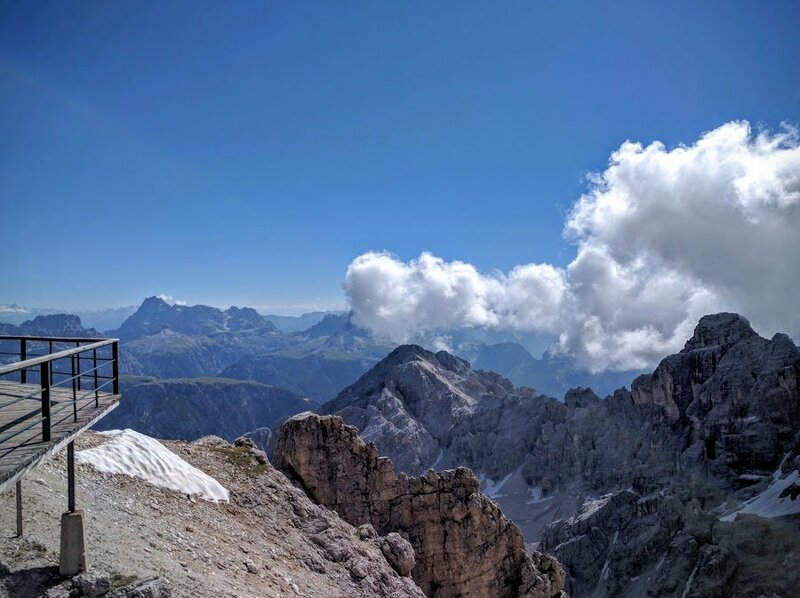 But Dolomites are also great summer destination - in warm months Dolomites are amazing place for hikers and climbers (there's the most via ferrata trails in Europe). "Dolomites" name was created in XVIII century. Before that they had been called Monti Pallidi - Pale Mountains. "Dolomites" name comes from French geologist Déodat de Dolomitu. This guy discovered that these mountain stones aren't pure limestone - they are mixture of calcium and magnesium ions. By the way, Déodat de Dolomitu was amateur scientist and he learnt the basics of geology... in prison (he got himself jailed for taking part in a duel). We may admire statue of Déodat de Dolomitu in Cortina d'Ampezzo. Unusually shaped stones and abundant flora and fauna made Dolomites part of UNESCO heritage in 2009. The highest summit is Marmolada (3342 metres). It's huge - Marmolada's ridge consists of several peaks: Punta Penia (3343 metres), Punta Rocca (3309 metres), Punta Ombretta (3230 metres), Monte Serauta (3069 metres) and Pizzo Serauta (3035 metres). There's an indigenous community living in Dolomites - they're Ladin people. Unfortunately, it's a minority - there's only about 30 000 of people who can speak Ladin language, which is, by the way, official language taught in schools and used in everyday life. This language is nothing like Italian - e.x. Gardena Pass is called Passo Gardena in Italian but Ladin people call it "Ju de Frara" (?!). The majority of Ladin people live in South Tyrol and have their cultural centre in Corvara village. The best trails in the world - via ferratas - were firstly built in Dolomites. Dolomites are built from fossilized coral reef from Tethys ocean which existed about 250 million years ago!